Showy chorus line of doubly-terminated tabular crystals and one RARE dogtooth rock crystal with a rosette and other 3-dimensional etchings from the erosion of calcite and sandstone. 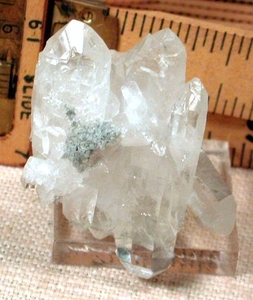 The main line of crystals is 1 1/4x 1/4", overall the cluster is 1 3/8x 7/8x 1 3/4" high. No damage, and a fine addition to your treasures.